Every second counts during military missions. A radar that detects and tracks enemy actions extremely quickly is therefore of vital importance. And that is exactly what the so-called Multi Mission Radar (MMR) can do. Today the army and Thales signed the contract for the delivery of 9 systems. The MMR will become the new eyes of the army. The MMR sees and registers everything, from drones and unmanned reconnaissance aircraft to planes, helicopters and missiles. Thanks to its simplicity and high degree of automation, the radar saves a lot of time. This applies to training, installation on vehicles, but also the actual deployment. Within two minutes, the radar is installed and ready for use. The development of this hypermodern radar was preceded by years of study and testing by specialists of both parties. It is the latest version of the Thales 4D AESA radar family which includes, for example, the Dutch Navy’s SMART-L radar. The MMR has been adapted for use on land. The MMR can be used for a large number of tasks: artillery support, 3D airspace surveillance and air defense. Also consider other security applications, such as locating weapons. The system can simultaneously detect, track and fully classify a large number of air targets. It can even distinguish individual tracks in a fire salvo. Its size has been limited by applying the most modern technologies, so the MMR is therefore particularly mobile and is easy to transport on a standard truck. The Commander of Land Forces, Lieutenant General Leo Beulen, said: "The exact reference of the MMR can be decisive for winning battles at great distances. 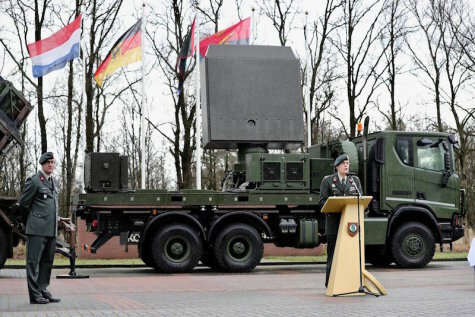 In addition, it strengthens the army’s air defense capabilities. This is possible because the system can respond to the constantly evolving air threat.